Rwanda has officially acclaimed a reputation for itself as the favorite place for Royal visitors attracting a king and a princess from the Arab world within a week. 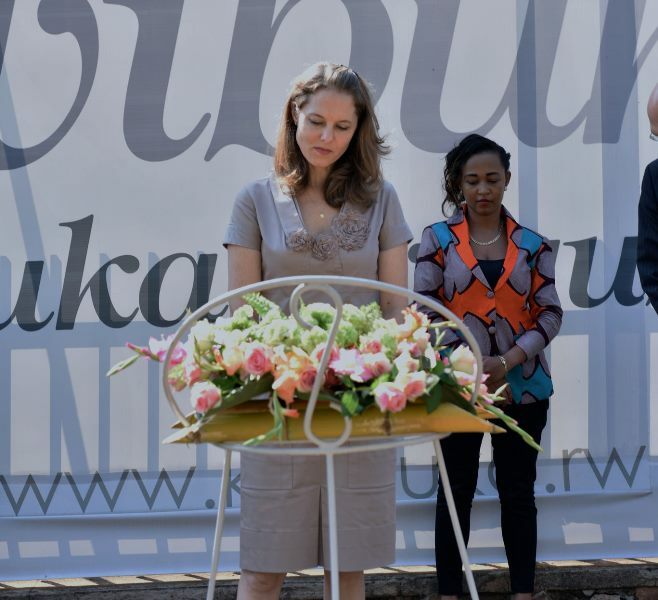 Her Royal Highness Princess Sarah Zeid of Jordan today arrived in Rwanda and visited Kigali Genocide Memorial to pay her respect to victims of the 1994 Genocide against the Tutsi. At the memorial, the princess was accompanied by Seraphine Mukantabana, Rwanda’s Minister of Disaster Management and Refugee Affairs as well as the United Nations High Commissioner for Refugees (UNHCR) Assistant High Commissioner for Protection, Volker Türk. She observed a minute of silence as a sign of respect and laid a wreath at the site. “Such courage to be reborn and move forward but never forgetting. An example,” the princess wrote heartfelt message in the memorial’s guest book at the end of her visit. 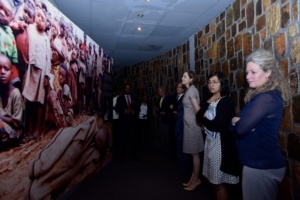 She was touched by the story of children killed in the genocide exhibited in the Children’s Room at the site. “What a lesson to the world! A lot to learn from” the UNHCR representative said in his message after the tour. The Princess will this Tuesday visit the Burundian refugee camp in Mahama, Kirehe District where she is expected to give a message of hope for thousands of Burundian refugees who fled to Rwanda after a political unrest broke in their country as President Pierre Nkurunziza claimed a third term in office. On Wednesday, the Princess will be part of a high level consultation between government of Rwanda and UNHCR, where, Burundian refugees’ fate is likely to be discussed. They will also have further discussions on cessation clause, which sets December 2017 as deadline to end refugee status for all Rwandan refugees who found asylum before 1998 in several African countries. Refugees can choose to either repatriate or get nationality from host countries. A joint communiqué of Ministerial Meeting on Comprehensive Solutions of Rwandan Refugees that was held in September this year in Geneva directed that those refugees who will not opt for either choice will not be catered for by UNCHR. The organization will focus on supporting integration of those who chose repatriation path. Princess Sarah is a Steering Committee member of the Every Newborn Action Plan, and partners with PATH to promote the recommendations of the UN Commission on Life Saving Commodities for Women, Newborns and Children. Last week, King Muhammed VI of Morocco touched on Rwandan soil for his three day official state visit and extended the visit to five days to explore the business and cultural opportunities in Rwanda. His visit ended up with 21 hot deals signed to make his historical visit. King Muhammed VI also visited the Gisozi memorial (Kigali based memorial) site to pay respect to genocide victims where more than 250,000 victims have been laid to rest.